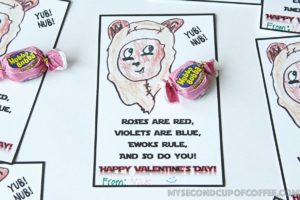 If you have a Star Wars fan on our hands, then these Ewok Valentines will surely make their day! Even more than that, they will love making them with you for their friends and sharing those funny sounds the goofy Ewoks make! 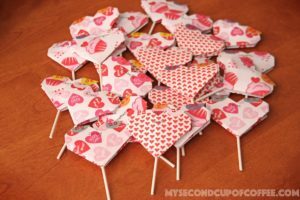 My son and I were trying to come up with a homemade Valentine last year that would use a Hubba Bubba bubble gum. As we were brainstorming and humming “Hubba bubba hubba bubba” to ourselves, it occurred to us that it was so similar to the sound that Ewoks made in the Return Of The Jedi! And so the idea for Ewok Valentines was born! Mother’s Day is a wonderful time of year to celebrate the mothers in your life. 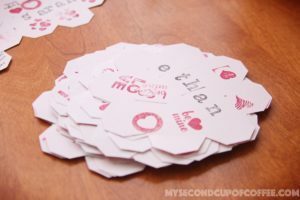 But what I love in particular is coming up with fun crafts that the kids can do by themselves for their Grandma. A few years back, we had made a beautiful vase for her, all decorated with kids’ fingerprints . 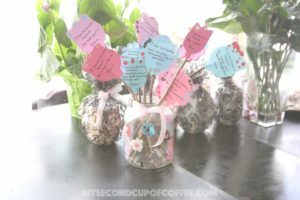 We also made paper flowers, all of which had sweet sentiments written on them to put inside. The idea was for my Mom-in-Law to use the jar as a vase for her bouquets all year round. But instead, she has kept it as is and proudly displays it on her shelf to this day. Whatever a special mom in your life decides to use it for, I think our Mother’s Day DIY Fingerprint Jar Vase will be a very special gift indeed! Valentine’s Day is nearly here, and that means—school Valentines time! 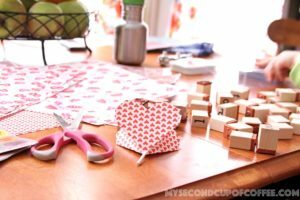 If you are looking for a hands-on project, the one that will occupy your child’s attention, allow him or her to use their imagination and also practice alphabet and patience, this project is for you!